LONDON--(BUSINESS WIRE)--A leading market intelligence solutions provider, Infiniti Research, has announced the completion of their market entry strategy for a medical devices industry client. Despite generating more than $180 billion in revenues, medical devices companies in the US medical devices industry have to face substantial competition. There are 5200+ small or medium-sized medical devices companies that employ few employees and generate little or no sales revenue. Moreover, investments in medical device R&D has doubled over the past few years and is expected to do so in the future, forcing companies to devise effective strategies to gauge market expansion opportunities. Therefore, medical devices companies must sustain a competitive advantage and leverage technologies such as microelectronics, telecommunications, instrumentation, biotechnology, and software development for scientific advances. Devising market entry strategies without accurately analyzing the medical devices industry can result in heavy revenue losses for companies. Get in touch with our experts and know how our highly skilled market research professionals can help develop precise strategies. The business challenge: The client is a leading company in the US medical devices industry based in the United States and is famous for developing innovative medical devices and drugs in their broad areas of expertise. Despite employing over 80,000 employees in 75 countries, the manufacturer was facing challenges in establishing their presence in a new market segment. They needed effective strategies to expand their reach by entering key target markets. This compelled them to collaborate with Infiniti Research and develop an effective route-to-market strategy. They also wanted a detailed report on the market entry barriers, new product development opportunities, threats, and competition in the medical devices market to minimize risks in investment decisions. Moreover, they wanted to devise business strategies that can decrease pressures and reduce costs for their organization. The solution offered: The solutions offered by experts at Infiniti Research helped the client to develop an effective market entry strategy. The strategy included detailed information on their business goals, budgets, major action items and timelines, and effective methods to monitor and evaluate their success on an ongoing basis. This helped the medical devices industry firm to analyze the competitors' view on the foreign company’s product entering their market, the global demand for medical devices, and the future growth demand for medical devices. Moreover, the comprehensive approach adopted by our experts helped the medical devices manufacturer to successfully gauge new business opportunities and drive profitability. They were also able to identify new growth opportunities by assessing the market trends for every single route-to-revenue. Want to predict global demand for medical devices and their future market growth in a particular region? Request a free proposal today! Analyze the global demand for top medical devices. Determine future growth demand for medical devices. Wondering how medical devices industry competitors view your product in their market and the challenges they can pose for your business while entering a new market segment? Request more information. Assessing the market trends for every single route-to-revenue. Enhancing their current route-to-market strategy. Interested in developing an appropriate market entry strategy that would help you transform your business processes from the ‘old ways’ to a new scalable and trackable business strategy? Request a free proposal today! 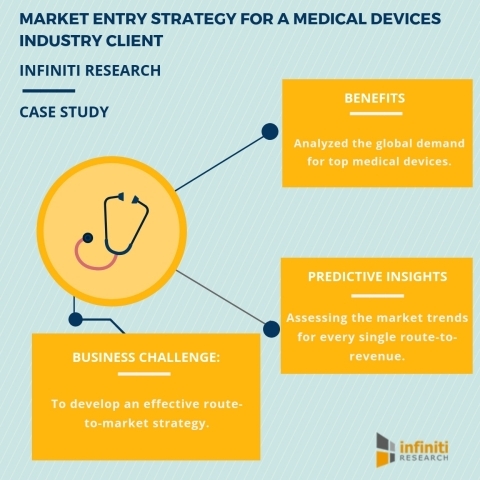 Infiniti Research has announced the completion of their market entry strategy for a medical devices industry client.